From humble beginnings in a basement of a ASPIRA to a 12,000 sq ft building and most recently a close to 25,000 sq ft building Taller Puertorriqueño has grown from a humble grassroots organization to a burgeoning force in North Philadelphia. From being able to serve 60 students at a time to a current max of 150, the growth that came with the development of the new property expanded Taller’s reach and community. From a small basement to a 2.3 acre plot of land, Taller Puertorriqueño has had a long journey to 6th and Huntingdon where it currently stands. 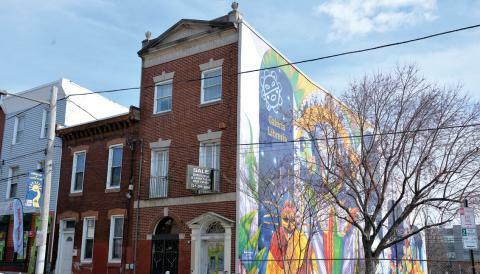 Built with the long-standing intention to serve the community and it’s needs Taller has grown with North Philadelphia. With high ceilings, floor-to-ceiling windows, and an open floor plan, the new center for Taller Puertorriqueño is nothing less than impressive. 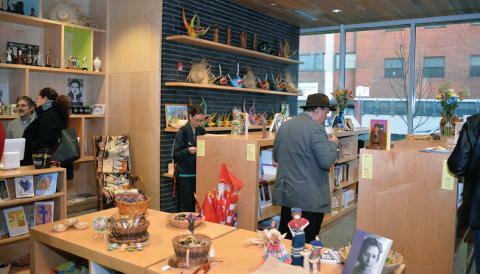 Providing all the same elements the community has come to expect from Taller: a cultural gift shop, student classrooms, and an art gallery, the space offers a revamped version of what the older building provided for over 40 years. “That is what this building represents for us. It represents growth, it is icon of pride and gathering and celebration of who we are and our culture,”said Executive Director Carmen Febo San Miguel. But as the Executive Director Carmen Febo San Miguel will tell you, the path to the new state of the art facility was not always easy and neither was the choice to keep it in the center of the North Philly neighborhood where it has always resided. In a quest for funding that took 10 years, several grants from the city and state, unwavering community support, and a dedication to being accessible to the community they sought to serve, Taller’s staff lobbied and worked to make the center what it is today. Providing everything from acting classes to fine arts education, Taller has helped shaped young artists in the community for over 40 years. It is this commitment to community, youth, and cultural preservation that has driven Taller over the years and created artist such as David Antonio Cruz and Michelle Ortiz. 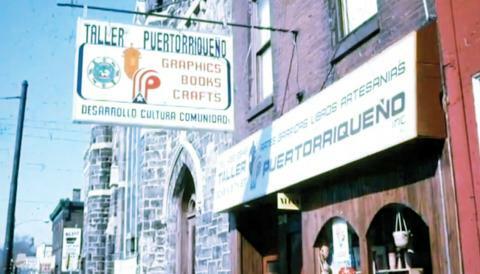 From the basement of a building owned by ASPIRA to a building donated by Domingo Negron, one of the founders of Taller and the current owner of GRAN Printing, Taller’s changing location has never impacted it’s support of the community. “Taller comes to life at a time when there was a consciousness of the rights of minorities who were being marginalized in American society. So it was the late 60s early 70s and everyone was talking about identity issues,” Febo said. Starting out as an effort to provide community alternatives for young Puerto Rican men who were dropping out at alarming rates in South Philadelphia, Taller wanted to teach the young men art and a trade in digital printing before they found themselves in other venues. “And Philadelphia was no different. A group of artists wanted to do something that was more youth focused and to use art and cultural identity and the immersion of where you come from and the conversation about who you are and where you come from as a tool to keep people engaged, to keep youth engaged in studies, academics, leadership development, which is what programs of ASPIRA was doing,” said Febo. The group started with Rick Hall and Domingo Negron and a group of high school and college students doing smaller programs. “They called us radicales because we were trying to do something that no one was trying to do,” said the former director. Hall had started a class with high school students and Negron had just finished a stint in Vietnam, “I was in art school right after I came from Vietnam. I was finishing art school and I was going to get into business. So, something was happening at ASPIRA where a group of students - high school students - and a few college students who were there at the time (it was only a few college student at the time who were Latino)” said Negron. He told the story of the growing Puerto Rican population in South Philadelphia and how often the students he served were migrating to the more northern parts of the city, “Everyone’s goal was to move to the boulevard,” said Negron. But he shared that despite a common history and a growing community many of the young people he was serving found themselves with no real sense of identity or home. “We were dealing with 2nd and 3rd generation Puerto Ricans with broken English, broken Spanish- and sort of you’re in limbo. And the city was still sort of racist,” he said. An effort that was finally rewarded, Negron and the group found themselves eligible for funding with an unexpected grant. “As soon as we get funded, the problems started. Because at that point it was Taller but it wasn’t an entity. But we needed to be an agency to receive this grant - I think it was 400,000 dollars - and it was to address the bigger problem at the time, mostly Eddison, Spanish and black kids dropping out and it was happening at an alarming rate - mostly guys, and they were doing nothing. We were trying to talk around that and the grant surrounded that particular issue we were trying to deal with- hard gang culture,” he said. After receiving the grant, they were able to expand their programs and work with others who believed in the work they were doing. Expanding after many moves and efforts to earn support, they found a closer location with the help of the church. It was then that Negron donated a building he owned and put it under the name of the Taller for the permanent location. After solidifying their location and getting their grant. Negron, who was executive director at the time was put in the difficult position of having to fire one of his cofounders, Rick Hall. Placed in the difficult position of losing the company he loved and also losing a friend, Negron left Taller with Hall. After an interim, Carmen Febo San Miguel worked with Johnny Irizarry and appointed him as executive director for Taller. Currently director of La Casa Latina at University of Pennsylvania, it was Irizarry’s first role as an executive director. Moving from Puerto Rico with his family to continue his education, Irizarry had never had specific executive director experience but said that Carmen Febo San Miguel believed in him and gave him a chance after he interned with the company for a while. “They gave me tasks to do like fundraising writing proposals - these were things I had never done in my life,” stated Irizarry. But it was with the understanding that the work could be done with time and effort from dedicated people. “Together we were able to expand the programming. We were able to bring in artists from PR. We had major opening. We were able to connect with the community adopt a few more board members. And doing more meaningful work for things that were impacting the community like HIV/AIDS,” said the former director. As the HIV/AIDS epidemic continued to impact the community, Taller held true to its mission and found creative ways to truly support the community’s needs. Operating beyond the scope of arts programming, the group shifted to support those who were working on the scientific and social issues that were related to the disease. “We learned how to collaborate and really use the resources we had at hand. We weren’t experts in the science and the social needs of AIDS patients and people suffering from AIDS. We bought an element of artistic expertise and strategy,”said Irizarry. But before they could support the community through programs, Irizarry shared that it was important to him and the others to build Taller through grassroots efforts that involved the community before it started. And it was through that work and through the connection with the community that Taller was able to work and create something that was truly great for the community. “When we opened up in that half-renovated space. They would teach in that space. They would teach in the basement they would even teach on Saturdays guitar lessons in my office. 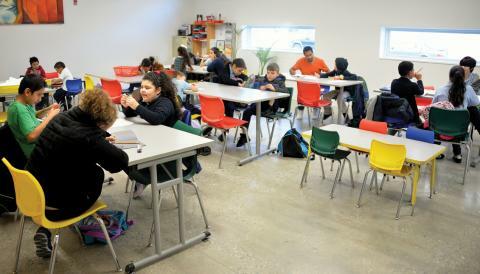 We used the space really creatively and in what I think were really meaningful ways and ways that they felt respected and engaged,”said Irizarry. But Irizarry will tell you that the success of Taller was through the long-term alliances the company built and their dedication to continuing those ties. "We built an alliance that hasn’t existed since with African-American cultural organizations, with the Latino organizations - at that time it was really Taller Puertorriqueño [...]. Jessie Bermudez needs to be mentioned when we talk about that period in Taller because he didn’t even have a space for Pamela,” the former executive director stated. But it was through this hard work and alliances that Taller was able to build its name and continue to serve the community in North Philadelphia in ways that no one had anticipated. “We were able to pull of f things that later Carmen and the board would go, ‘What happened? That was amazing’ and really it was because it was in their heart," recalled Irizarry. Unveiled in December of 2016, the new El Corazon Cultural Center is the result of over 10 years of grant proposals, applications for funding and over $100,000 in donations from the community. Carmen Febo San Miguel stated that it was the result of a lot of work and continued effort from each person who had a hand in sustaining Taller through the years. “I know that I am credited with the results we have achieved but what I would like to say is that it was the work of our team and a lot of it was luck and right place, right time,” Febo said. The biggest highlight in Taller’s history has been the construction of the new building, though Taller has had several locations since its inception. Moving from the basement of ASPIRA, to the church Annex to the building Negron donated, the current executive director, Carmen Febo San Miguel, found that Taller would need to expand to better serve the community. The true funding not only for Taller’s new land but also the expansion of the programs happened soon after they were able to coordinate the support of several community leaders including Mayor Street and Counilwoman Sanchez. The city’s Planning Commission recommended approval of a bill introduced by Councilwoman María Quiñones-Sánchez to rezone the property for the project. The project cost about $10.5-$11 million. Taller received an initial $1.5 million in funding from the Commerce Department back during the Street administration. They subsequently secured $5 million in Redevelopment Assistance Capital Program (RACP) funds from the state. Taller was also a finalist for a $300,000 grant from ArtPlace America. Taller has raised more than $150,000 from private sources for the cultural center. That includes commitments from a corporation and foundation, and the rest came from members of the community, as well as the McClean Contribution. After years of hardwork and dedication and the persistence of Carmen Febo San Miguel, Taller Puertorriqueño was able to acquire the new building and create cultural center on what is now a 2.3 acre surface parking lot at North 5th and West Huntingdon streets. The new facility, known as the El Corazón Cultural Center, is a place to enhance the educational programs they already provide, and serve as a new foundation for cultural expressions and experience in the heart of Latino Philly. The design firm Wallace Roberts & Todd was key in developing plans for the new building that includes flexible, multi-use rooms for events and classes, offices, as well as an incubator space for creative start-ups, a café and shop to help support the building, and a versatile floor plan. But the director says the most important thing is what the new building represents to the community. “We as a community have accomplished what has happened here. We as a community can all be proud of what happens here. It’s a message you know we’re here. Our community is vibrant. Our art and cultural expressions are vibrant. Come learn. Come experience it. Join us,” said Febo. Not everyone is as excited about the new budget though as worries have come in that listening to the community. Founder Domingo Negron stated that he worries with big funding, it will be hard to serve the community in diverse ways. “Taller has always grown with the people and sometimes with big grants you have to go with what the grant wants but I think it’s good and incredible what has been able to be done,” stated Negron. When you first enter the facility you’ll see the bookstore and gift shop filled with flags, books, art and more. The maintenance of cultural pride and and identity in urban communities is a mission that isn’t usually seen on classroom agendas. But it is this mission that the founders of Taller built the organization on, believing that with a strong foundational understanding of the history of the community and originally, the Puerto Rican identity, the students would be more equipped to approach the world. “An understanding that came out of our activism and that came out through our experience over the past 40 years is that kids develop a much better grounding when they connect to that heritage and that cultural space,” stated Febo. Taller was created to functionally act as both a center for cultural learning but also an archive of the community. “We get kids who say they’re Puerto Rican and they didn’t know anything about Puerto Rico and then there’s the sense they connect with that heritage,” said the director. From Taller’s beginning art was more than an activity or something for the children to do. It was a way for the students to engage with art and better their perception of themselves for a better future. “For us art is not just art for art’s sake but its a tool, its a presence, it’s a expression, it’s a venue, it’s a space for the creation and celebration of all of this talent and creative energy that we fought very hard to develop that space and it’s very much needed in the space - it’s the the heart of the community,” said Febo. What once was a program that was dedicated to dealing with the high dropout rates they saw in the community, Taller continues to be an alternative to some of the more dangerous activities that the students can get into. “The forces that are pulling them in so many different directions are multiple. It’s sports -it’s - and if they’re engaging in positive activities that’s wonderful but unfortunately some of them are more negative,” said Febo. But it is the creative programming and dedication to serving the community that keeps Taller thriving. “We struggle to come up with ways in which we can make it attractive so we can grab them. Once they’re a part of the program though, it tends to be easier - they understand. It gets to their heart as well,” said the director. While Taller has survived as an arts program for youth in the North Philadelphia community, with the new facility, the new program can expand even more to serve students in every stage of their development. Currently a K-12 program, Executive Director Carmen Febo San Miguel says she hopes to bring the program to a more comprehensive level by either providing Pre-K programming throughout the year or by providing a K-16 structure for those who may need it. “We are looking to develop a long term educational program. Whether that turns into an education program after high school or pre-k programming, we’re not sure,” stated Febo. Carmen Febo stated that this type of programming expands Taller’s impact and the opportunities in the community for education. Not only does it provide education but it works as a way to build a space that can be recognized as a venue for quality artistic expression for Puerto Ricans and Latinos in Philadelphia.